Advocate staff photos by MATT SLEDGE -- Family members of Eric Harris protest over his death at the hands of Jefferson Parish deputies outside New Orleans Police Department headquarters on Friday. 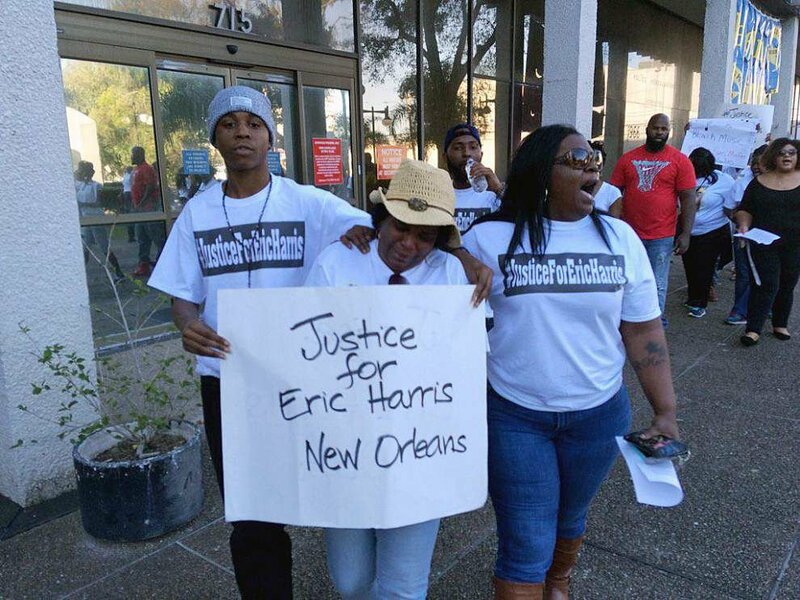 ADVOCATE STAFF PHOTO BY MATT SLEDGE -- Eric Harris' family appears at a protest at New Orleans Police headquarters on Friday afternoon. Harris was fatally shot by Jefferson Parish authorities after a car chase that ended in Central City earlier this week. 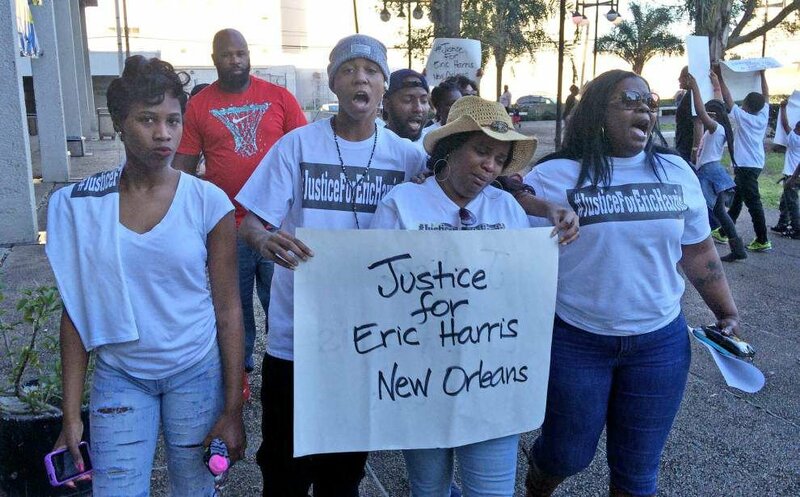 About two dozen people, some with "black lives matter" signs, protesting the fatal shooting of Eric Harris appeared in front of New Orleans police headquarters Friday afternoon. Harris was killed by Jefferson Parish deputies earlier this week. The incident occurred in Central City so the NOPD is leading in the investigation. Col. John Fortunato, a Jefferson Parish Sheriff’s Office spokesman, said the two deputies who opened fire on the 22-year-old Harris acted in self-defense after Harris shifted his vehicle into reverse and began backing up in their direction. He said Harris ignored deputies’ orders to surrender even after he crashed his Infiniti about 8:15 p.m. Monday near Simon Bolivar Avenue and Philip Street. The police chase began at a mall on the West Bank of Jefferson Parish went into New Orleans’ Central City neighborhood. Jefferson Sheriff Newell Normand said the police pursuit began shortly before 8 p.m. when three women alerted a deputy on a paid security detail at Oakwood Mall that Harris had pointed a gun at them. After he broke free from a deputy and drove away, the sheriff said, authorities eventually spotted Harris’ vehicle on the West Bank Expressway, where it “rammed” into a JPSO vehicle and set off a chase across the Crescent City Connection.